Spooky things are all around this type of year. The closer we get to the end of October the more spooks become part of the decoration around neighborhoods. This time of year, I'm seeing more and more of a certain type of spook in my house. To me, spiders are probably the spookiest creature out there and I am seeing more and more of them inside my house as the weather gets cooler. Never mind the spooks and creepy Halloween images, these spiders are the creepiest things out there. EEEEK!! The spiderweb DSP is from a retired set, but I thought it went really well with the spider stamp from the Frights and Delights Paper Pumpkin set. 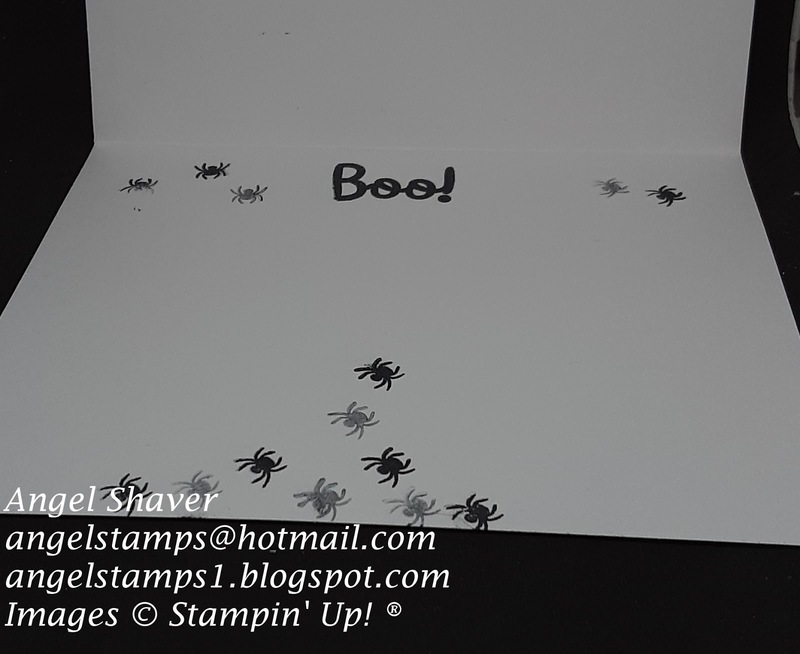 Those spiders are just crawling all around the web and on the inside of the card as well. 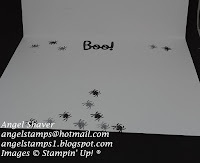 I decided to also use the sentiment sticker from the Paper Pumpkin kit that expresses how I feel about spiders so well . . . "eeeek!" The gorgeous grape glitter dots and pumpkin pie enamel dots add a pop of color to the card and represent the insects caught in the web. Thanks Elizabeth for adding the Boo on the card inside. It's a perfect finishing touch. Make sure you head over to FabFri148 to see the inspiration cards by the design team and other creative entries. 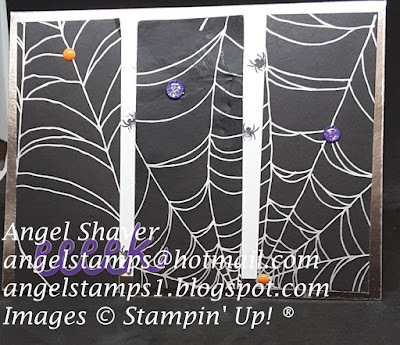 Very cool and spooky spiderweb card! 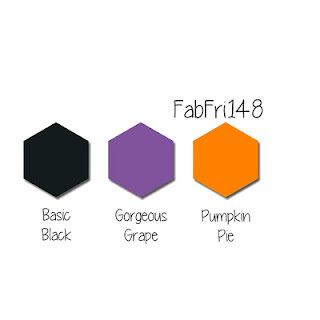 Perfect colors for Halloween! Thanks for joining us at Fab Friday, hope to see you again soon! Eeekkk! Glad I'm not the only one with more spiders in the house lately! I like the ones on your card better for sure! 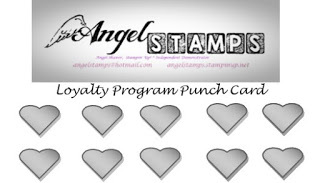 The glimmer dots add a fun element and I like the triple panel layout! Thanks for sharing at Fab Friday! I definitely prefer the spiders on my card as well. They are sure smaller than some of the ones I've been seeing. 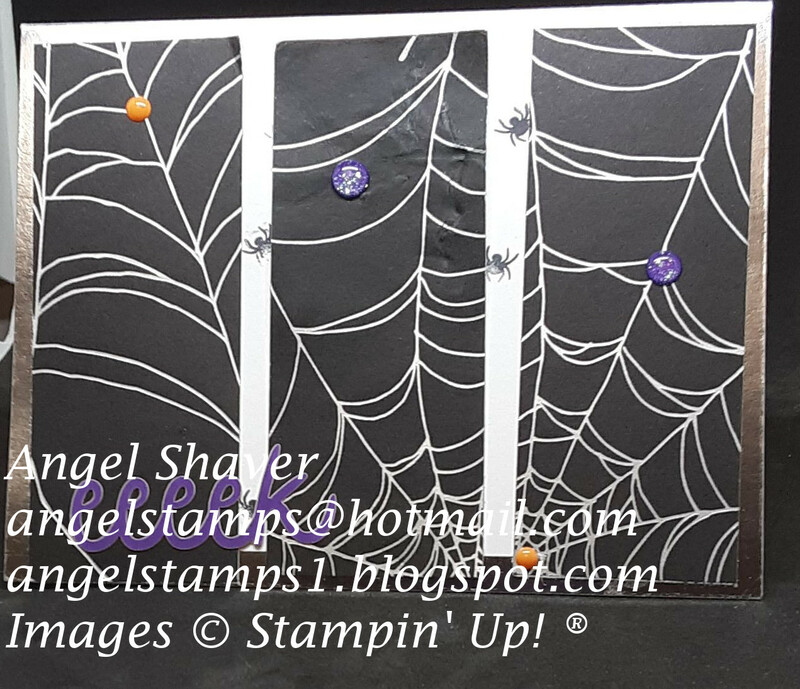 Love this spiderweb paper - and I love the panels! Plenty of spaces for the crawlies and sparklies, lol... Too cute! Thanks so much for playing at Fab Friday!